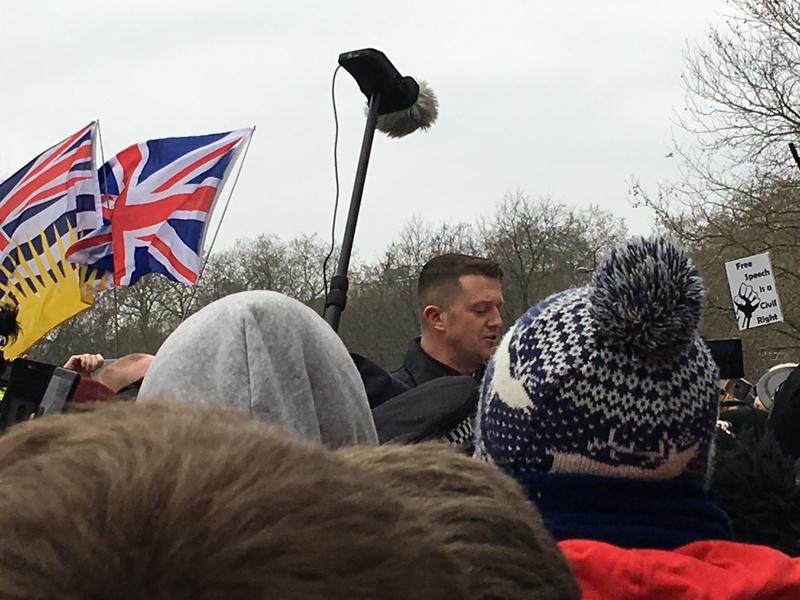 I along with many others spent toddled along to Speakers Corner on a cold snowy Sunday to listen to a speech that if it hadn’t been for the actions of the UK Government probably wouldn’t have got me out of bed. A little while ago a chap called Martin Sellner wanted to come over to the UK to give a speech at Speakers Corner, personally I’d never heard of him but our ever vigilant Government had and decided to detain and deport him to prevent him spreading ideas that could undermine the very foundations of our society. Whilst they were are it, they deported his partner and also prevented a Canadian Journalist from visiting the UK. The latter two for wanting to interview Tommy Robinson and for saying that Allah was gay respectively. This obviously caused a bit of a kerfuffle on the internet and is rather worrying we shouldn’t be banning people just for ideas, let alone for wanting to interview people. As a response to this Mr Robinson announced that he’d toddle down to Speakers Corner himself and deliver the speech on Mr Sellners behalf. Well if the Government doesn’t want me hearing something I want to hear it, our Government apparently hasn’t heard of “the Streisand effect”. More than that though freedom of speech is far too important not to defend, and the people’s whose speech needs defending is those that we disagree with, that the Government doesn’t want us to hear, that anyone says shouldn’t be allowed to speak. So not to support anyone’s politics or beliefs but to support their right to speak and to express those ideas I hauled myself off to Speakers Corner to listen to what was to be said. towards the matter of the speech. During the heady days of the occupy movement the widely held wisdom was that to identify who wants a fight look to see who’s come prepared to have one, well today at least the masked and aggressive types were not those there to support either free speech or Mr Robinson. As with all the best protests/demo’s/events things sojourned to a pub, where I got to meet a bevy of new and interesting people and matters of the day were discussed. I suspect that many people will complain that the main stream media won’t give suitable coverage to this event, but realistically this event wasn’t news. There was almost no trouble, the crowd wasn’t massive and there are endless demonstrations in London that also don’t make the news. The only think news worthy from the legacy media’s point of view would be Mr Robinson and other “celebrities” attending but a quiet and reasoned speech being delivered on behalf of someone else isn’t going to interest them that much. That said this was a victory for free speech, a small one but a victory none the less. It was good that so many people turned up to support not Mr Robinson but the principle of free speech – the question though is what next? How can the fight be continued, is this a moment of awakening and the start of action or will we all go back to sleep again until the next time? Will we fight for the right to free speech for everyone, or surrender it to avoid words we don’t want to hear? I hope that we’ll fight and that we’ll win as without the freedom to speak there are no other freedoms and the path of dissent is rapidly reduced to violence. Tagged #SpeakersCorner, activism, censorship, Civil Liberties, interesting times, London. Bookmark the permalink.